Yesterday I spoke with a woman in Hawaii. She called because she’s reading The Only Little Prayer You Need, and she wanted to let me know how much she’s enjoying it. That meant the world to me—not only because she took the time to call, but because it tells me that Spirit keeps spreading the book’s message wherever it’s supposed to go. It’s like witnessing another light turning on. And that’s so important in a world that needs all the light it can get right now. That’s what writing a book does. It reflects the light in you so you can share it with people you’ll never even meet. And that’s why I developed two new writing courses to help you write a book that matters—one that can make a difference in the world. They’re totally self-paced. You can download all the modules and work through them on your own schedule. And all the materials are yours to keep. They include my best advice on writing a book. These are the tools and techniques I teach at writing retreats and in one-on-one coaching, and now they’re yours to use as you develop your message. They give you spiritual support as you write. 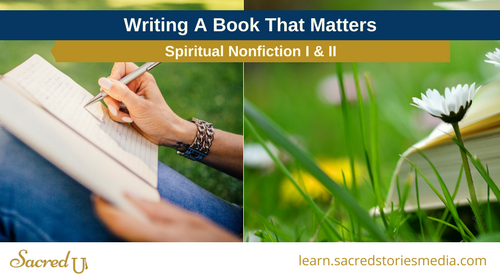 Each module includes a guided visualization to help you receive wisdom and guidance and grow into your role as a writer. You can preview the first module at no charge. Just click on the Free Preview button and start today. If you’ve felt a call to write a book, this is your opportunity to take it from start to finish, with help every step of the way. We need your voice, your message, and your light. P.S. One of the courses is for starting your book, the other is for finishing it. Sign up for both courses together and get a 25% discount….plus six bonuses, too!